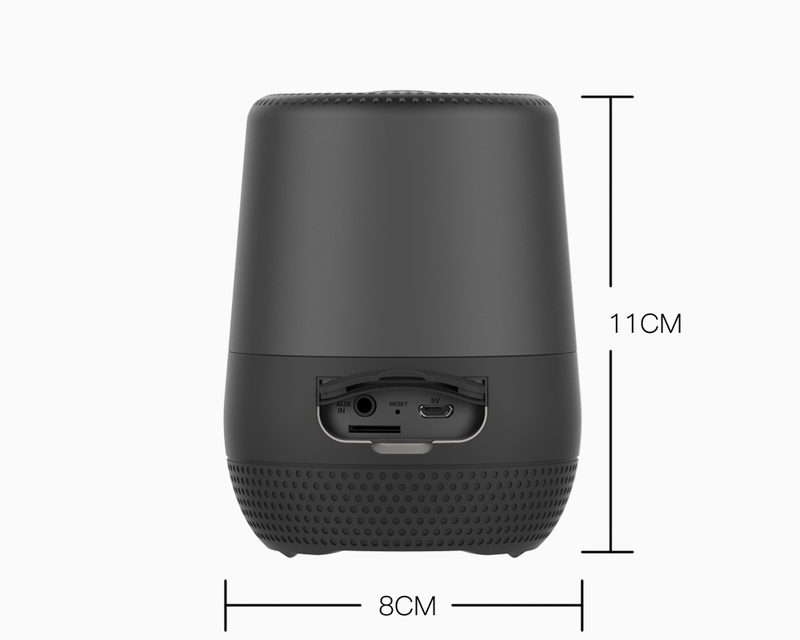 With this portable Bluetooth speaker, you can feel the experience of 360 degrees listening. Blossom is a floral-inspired portable Bluetooth speaker that will give you different sensations of sounds in your home. 360 Home speaker uses breakthrough newest technology to equally project exquisite audio in all directions so wherever you move, you’re always in the sweet spot. Stream your favorite music from your mobile device to 360 Home speaker using Bluetooth or home assistant. It is water resistant, or splash proof. You can take it with you into the shower, or by the poolside. Fast delivery. This is the most satisfying experience I have ever had in AliExpress shopping. Perfect packaging, very beautiful and upscale, the product's sound quality is good, strong stereo and bass effects, the current work It has been more than 20 hours, but there is still a lot of electricity, strongly recommended to buy it. Could be louder and pairing is pretty hard sometimes but ... sound and bass just great and battery lasts 15 hours on almost max loudness so pretty impressive! Recommended! Mükemmel ses kalitesi çok iyi. Cabuk geldi. Guzel paketlenmis. This speaker is awesome. I use it in the shower. When connected to my LG G5, I can tap the + or - volume button to change songs. sound quality is great for this size of speacker. i trully recomend. material is nice to touch. The sound is perfect. Its an awesome speaker....worth every penny. Battery backup is good...bass and sound quality is good. Very good condition. Sound and bass excellent, no background noise. Love The speaker. For the speaker so small yet powerful. Very good playback time. Very nice sound quality and very good bass for such a small speaker. Design is very elegant and sound is perfect. Buy it you’ll love it. Thanks seller keep up the good work. Super!! Grande qualidade em todos os sentidos! superou as expectativas! muy buen parlante con buen sonido. This speaker had an excellent sound. I Love the speaker.. I use it in the shower and have no issues at all. I also use it every where around the house so far.. I wanted a nice sounding bluetooth speaker that doesn't break the bank and would have decent sound. Purchasing this was a great choice and I would highly suggest purchasing this product if you are in the market for a great sounding portable speaker. The sound is incredible. I have it paired with my Echo Dot so I can listen to music in the shower. I can also carry it all around the house without the signal dropping. The sound quality on this speaker is amazing! I was pleasantly surprised at the clarity of sound-even as I cranked the music up loud! Also seems nice and durable, I have LOVED this product, and recommend it to any of my friends looking for a durable waterproof speaker. This is one of the best portable speakers I've heard So, all in all - very good. It is loud, it does not rattle at highest sound level. It is waterproof (did not test yet and doubt will test intentionally). Easy to connect and easy to carry. fast delivery, packing was really nice. system is really good in sound, really worth it. has good subwoofer. very easy to connect via Bluetooth. Fast shipping! Nice and safe packaging. Reliable, quality product. Thanks! The product was better than expected. Certainly worth the money and more. Strongly recommended. Delivery is relatively fast. I am satisfied with the sound quality as expected. Excellent seller and sound quality, very happy with product! Material quality is excellent too and rubber do not smell like cheap rubber. Highly recommend product and seller! Product arrived fast, quality of the product is as good as on picture. I suggest this seller. I love this speaker! Great sound! I originally bought the JBL clip and returned it because I was NOT pleased! Bought this one and LOVE it! I also use it at home! I am very please and recommend this! Great battery life!!! The quality is pretty incredible with far more bass than I would ever expect to pump out of something so small and even at the highest volume levels, it doesn't rattle or get all distorted. The quality is amazing, the base is very good, the battery last long.